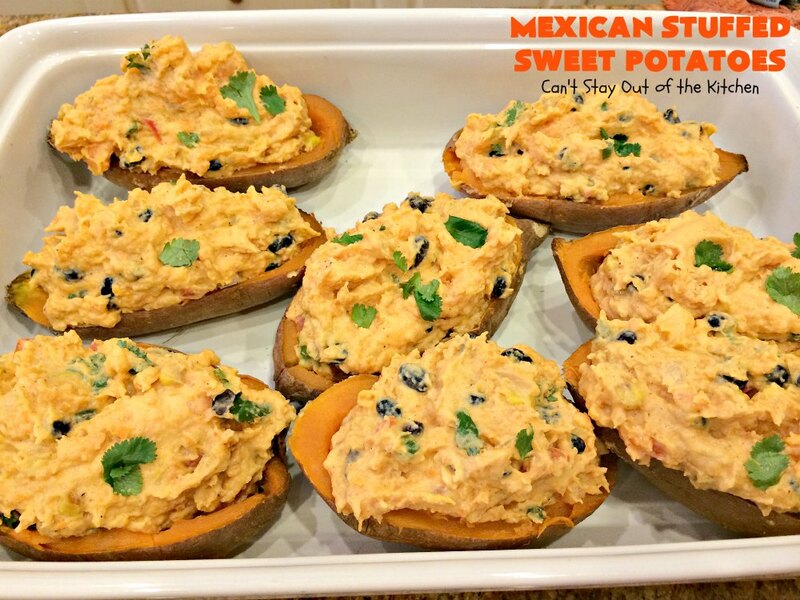 I absolutely love these Mexican Stuffed Sweet Potatoes. 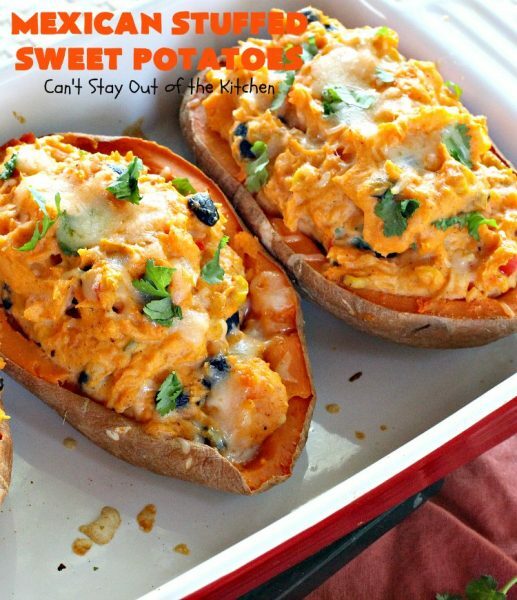 Seriously, this is one of my all-time favorite ways to eat sweet potatoes. That’s saying a lot, since I probably have 20 or 30 ways to indulge in sweet potatoes. 😮 The flavors are awesome and the texture is sumptuous. This is a great recipe to make for Meatless Mondays, Lent or other times when you want to eat lighter and reduce your meat intake. 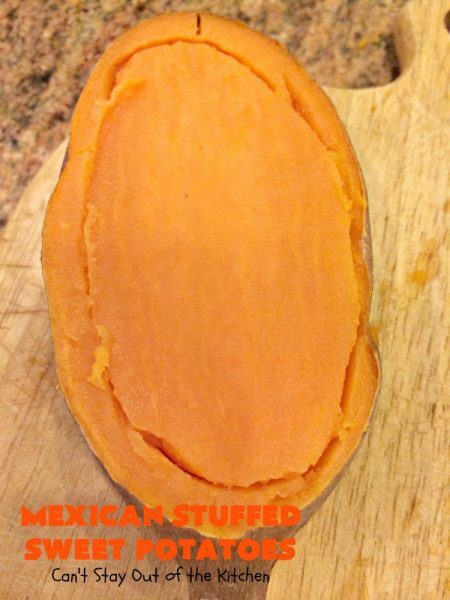 This recipe for Mexican Stuffed Sweet Potatoes has to be one of the BEST recipes I have found on the web. It is so fantastic I’m going to start making this regularly. 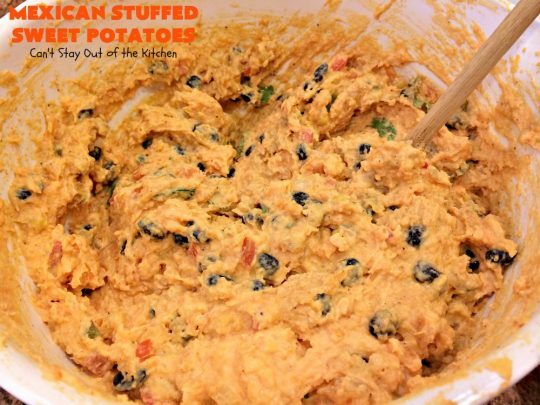 You can make the filling and put it back into the sweet potato or just pour the whole mixture into a casserole and bake it–either way it’s A-M-A-Z-I-N-G. Even my hubby who’s not usually too enthralled with some of my health food combinations really enjoyed this recipe. If you’re looking for a superb recipe for Cinco De Mayo this is it! 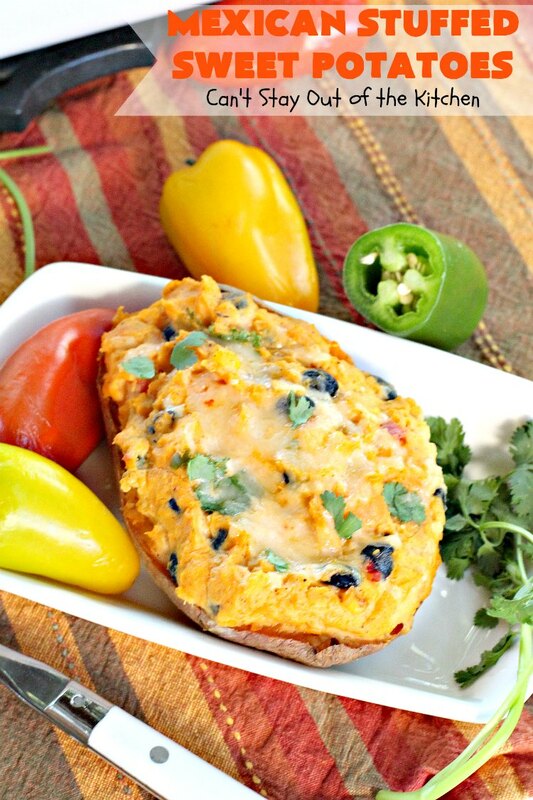 Mexican Stuffed Sweet Potatoes are hearty, filling, packed with protein, seasoned deliciously and have a wonderful texture. This recipe can be served as either a main dish or side dish with chicken, pork or beef. 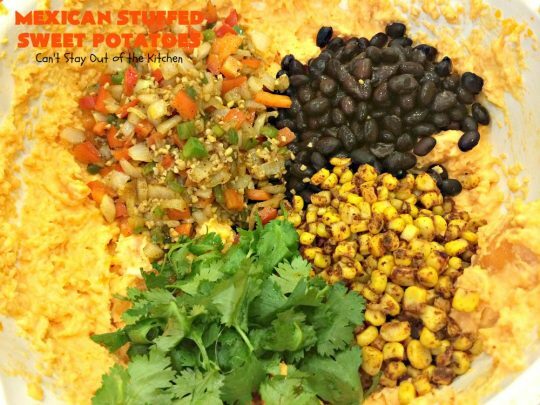 The sweet potatoes are baked and the potato is used in the stuffing along with black beans, corn, red bell pepper, onion, garlic and a little sliced serrano pepper. Diced chilies or jalapeno pepper are options if you prefer them. The mixture is creamy due to the Chobani Greek yogurt and cream cheese mixed in with the baked sweet potatoes. It’s subtly spiced with cumin, chili powder, and cilantro. 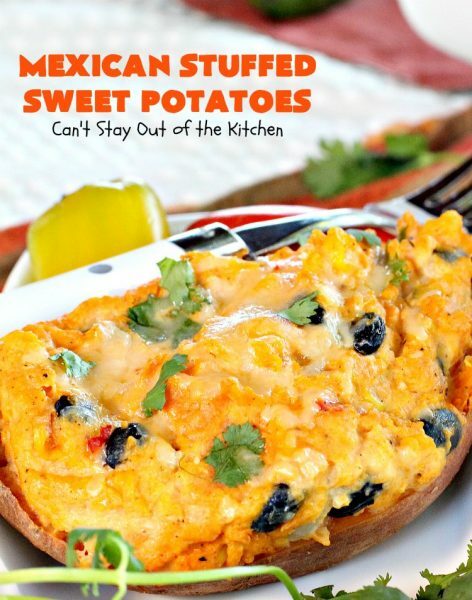 All I can say is the combination of flavors is so mouthwatering I wanted to eat more and more and more of these delicious Mexican Stuffed Sweet Potatoes. I seriously think I could eat this recipe several times a week and not get tired of it. For someone who enjoys a lot of variety in her meals, that’s say a lot. I found the recipe at Kim’s Healthy Eats and though I’ve made a few changes the recipe is excellent. 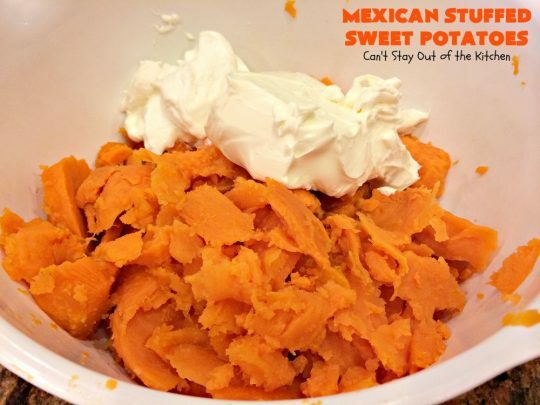 One of my main recommendations is to use 6 sweet potatoes with this recipe rather than just three. There’s quite a bit of filling with the black beans and corn and having a little more sweet potato in the body of the filling is more to my liking. If you aren’t so worried about calories consider adding an extra half cup of cheddar cheese into the filling and then add plenty on top, too. 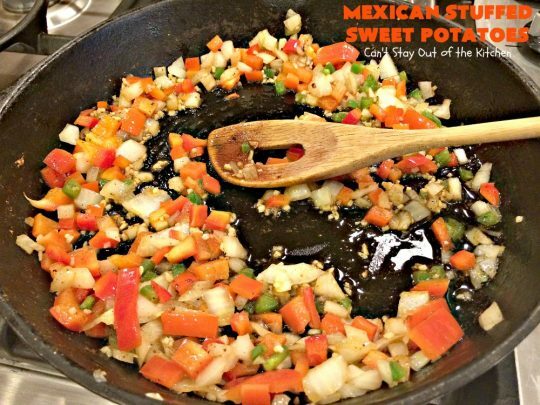 If you’re looking for a healthy, low calorie, gluten free, sugar free side dish or main dish, please consider this amazing option. It’s thick, nourishing and substantial. You really can serve this as a meatless main dish. It’s also wonderful reheated later! You won’t be disappointed by trying these tasty Mexican Stuffed Sweet Potatoes. I originally published this recipe in February 2013 before I invested in my Canon camera. When I first started my blog I really didn’t know anything about taking pictures. Many were deplorable, some were outright embarrassing! I’ve been going back through all my old posts to add recipe cards (to make them printer friendly) and reduce the picture size so the posts will load more quickly. But these pictures were so bad I knew I needed to remake this delicious recipe again (August 2014). 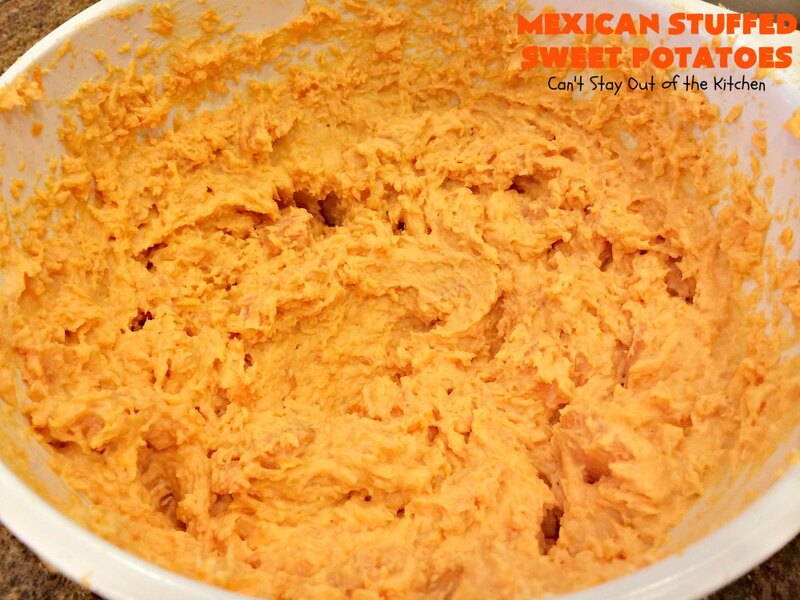 That way you could get a better idea of how scrumptious this amazing sweet potato dish truly is. I think I could eat these potatoes every week and not grow tired of them. They are truly amazing. I hope these new pictures convince you. Mexican Stuffed Sweet Potatoes are a spectacular Meatless Monday recipe. This picture shows all the Monterey Jack cheese on top and the potato stuffed with corn, black beans, and red peppers. 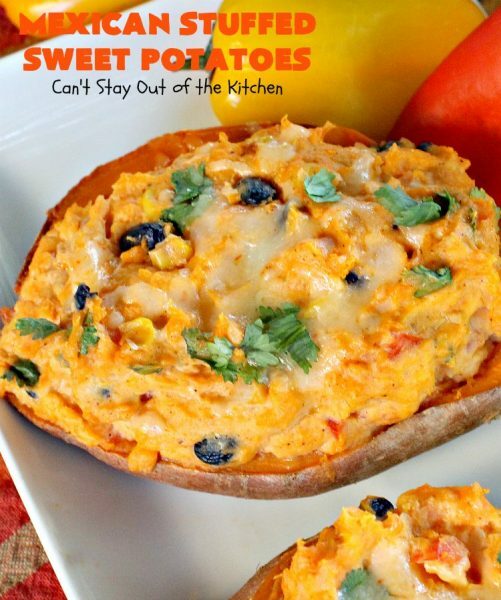 Don’t Mexican Stuffed Sweet Potatoes look delicious? The combination of flavors in this great recipe are incredible. I couldn’t get enough of these potatoes. 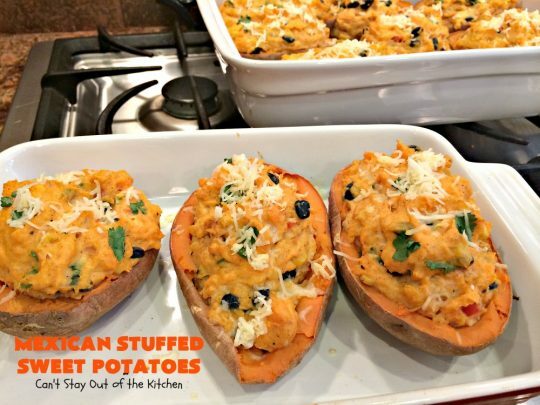 These sweet potatoes present very nicely on the plate, too, if you’re looking for a nice side dish. Lots of cheese is melted on top giving this a richer, cheesier texture. 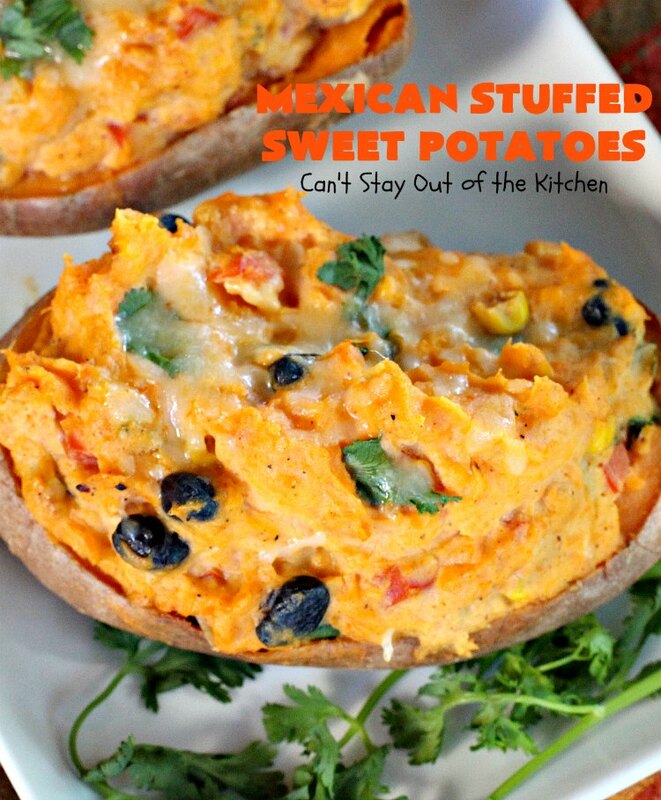 Mexican Stuffed Sweet Potatoes are healthy and delicious! Bake sweet potatoes about an hour to an hour and 15 minutes at 350. Don’t overbake them or you won’t be able to stuff the shells very easily. Slice potatoes in half lengthwise. Then with a spoon or knife make an indentation in the potato leaving a 1/4″ border. You don’t want to take all the potato out of the shell. Otherwise, the potato will fall apart and be flimsy. Leave a nice border and scoop out potato into a mixing bowl. Mash potatoes with a potato mixer. Add cream cheese and sour cream or plain Greek yogurt. Mix potatoes with an electric mixer until creamy. In a cast iron skillet place corn without any oil. Canned, frozen or fresh corn all work well. Season the corn with cumin and chili powder. If you like your foods spicy add as much as you desire. Saute corn about 10 minutes. Remove corn from cast iron skillet and set aside. Dice red pepper, onions, and a serrano or jalapeno pepper. You will also want to seed the pepper. If you use a whole serrano pepper this will be VERY spicy. You might start with half and then increase it in subsequent batches as your tastebuds desire. After you remove corn from skillet, add coconut or olive oil to skillet. Then add onions, red bell pepper, and serrano pepper. Cook a few minutes. Add fresh minced garlic or minced garlic from a jar and continue sautéing. Saute veggies approximately 5-10 minutes or until tender. Add black beans, corn, fresh cilantro and onion/pepper mixture to the creamed sweet potatoes. Stir until well mixed. Add an extra half cup of shredded cheddar cheese now if you would like an extra cheesy flavor. 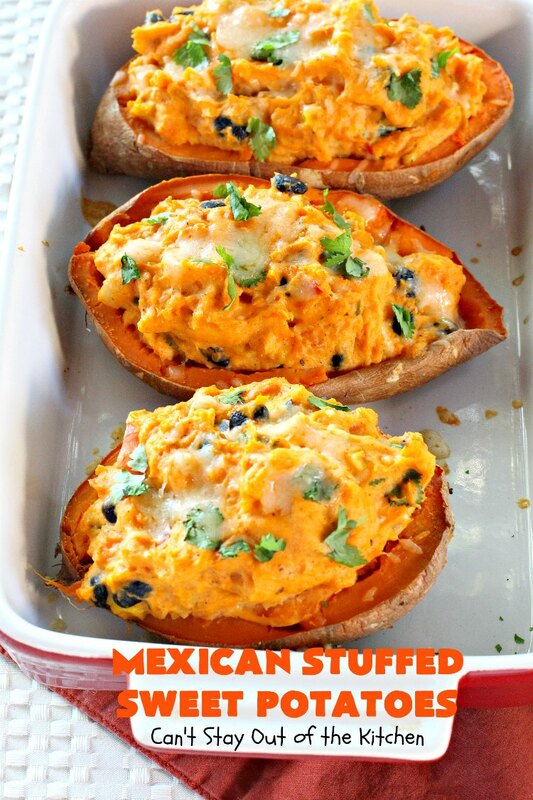 Pile sweet potato mixture into hollowed out shells. Bake at 350 about 15-20 minutes to warm the potato ingredients. Remove from oven and add shredded cheddar, Monterey Jack, or Habanero Jack cheese on top of each sweet potato half. Bake an additional 5 minutes until cheese melts. Bake an additional 5 minutes or so until cheese is melted. While the original recipe calls for broiling the cheese, I don’t recommend that method. The cheese burns too quickly. Just bake the cheese on top like you would for any other casserole. I loved these Mexican Stuffed Sweet Potatoes so much I told my husband he couldn’t eat any of the leftovers–they were mine!!! The southwestern flavors in this baked sweet potato are superb. 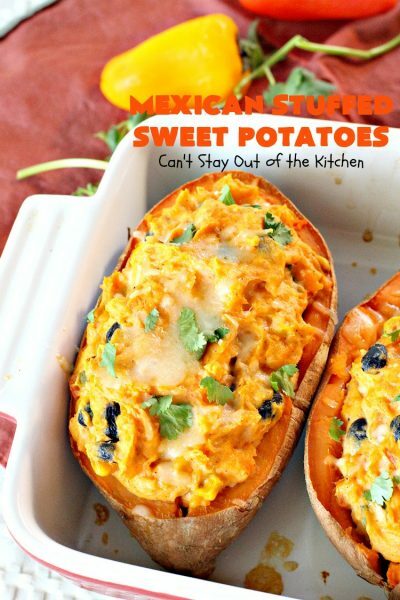 These Mexican Stuffed Sweet Potatoes are so appetizing. I bet you’re wanting a taste just about now! Additionally, Mexican Stuffed Sweet Potatoes are hearty and filling, not to mention, healthy, low calorie, gluten free, and sugar free. 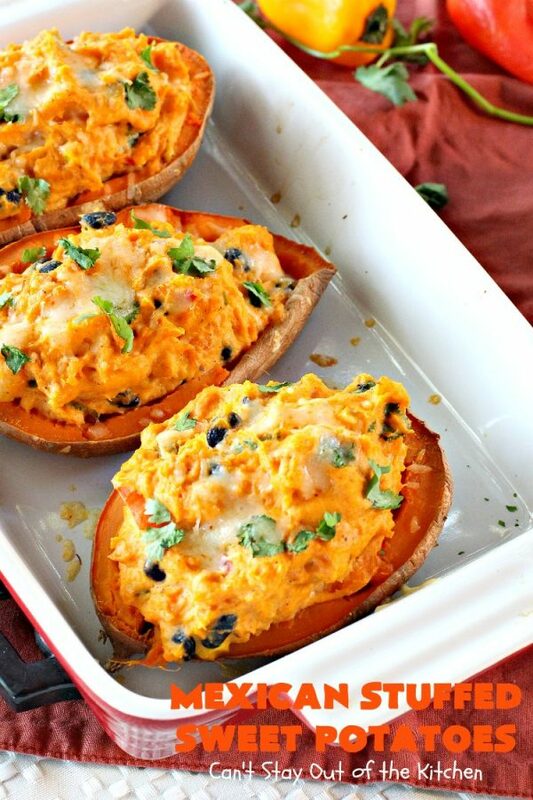 I L-O-V-E-D these sweet potatoes. I could eat them every day for lunch. The potatoes reheat very nicely in the microwave. Fabulous Tex-Mex style stuffed sweet potatoes with black beans, roasted corn, serrano pepper and cilantro. 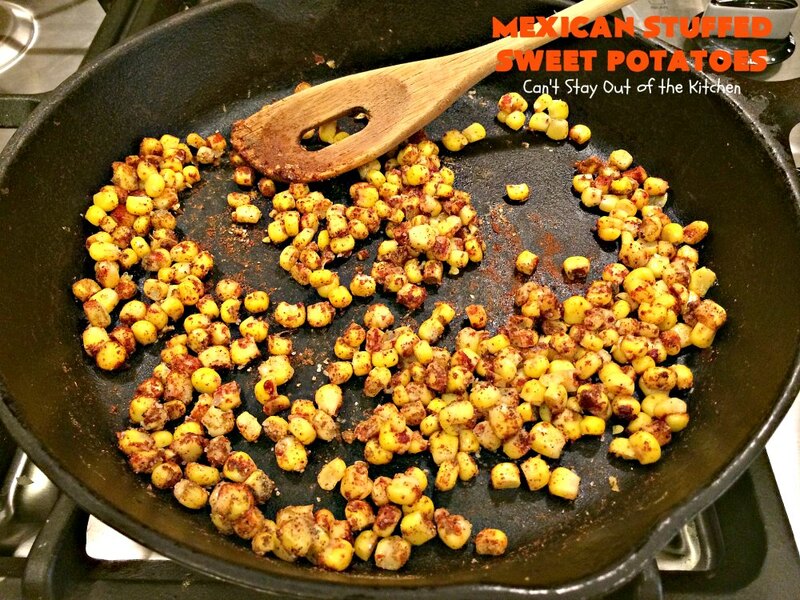 Great for Meatless Mondays or as a holiday side dish. Healthy, clean-eating, gluten free. Recipe adapted from Kim's Healthy Eats. 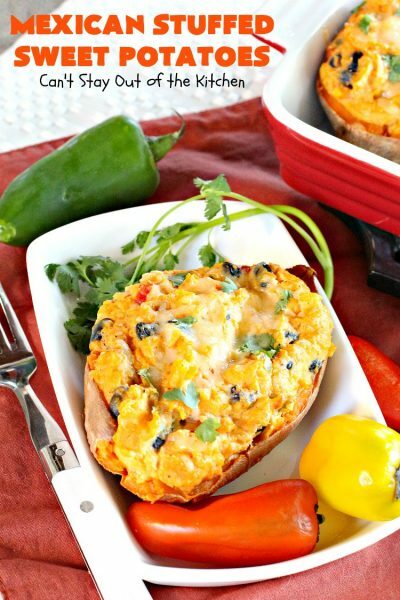 Fabulous Tex-Mex style stuffed sweet potatoes with black beans, roasted corn, serrano pepper and cilantro. 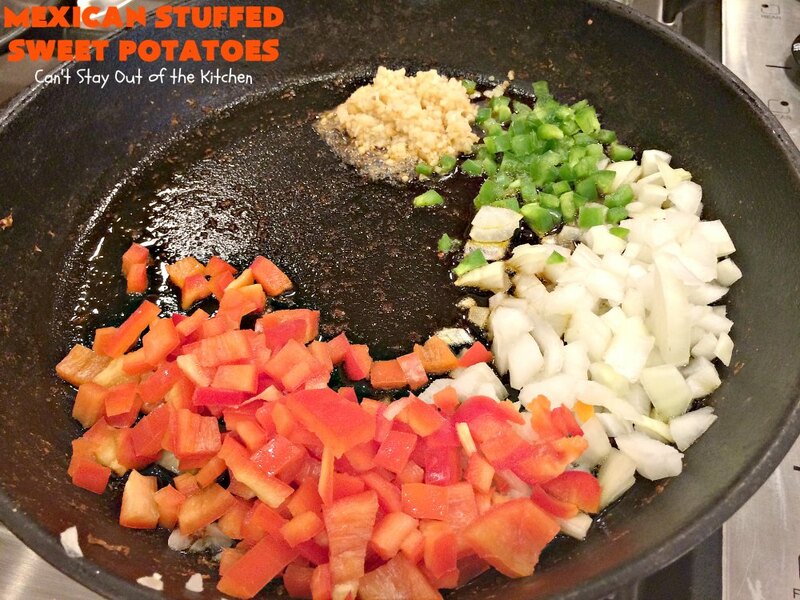 Great for Meatless Mondays or as a holiday side dish. 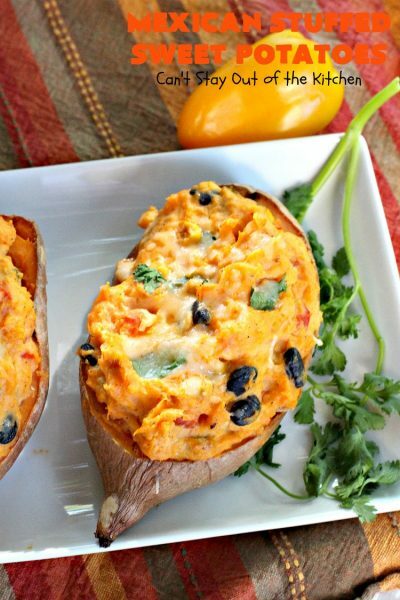 Consider this healthy alternative for Meatless Mondays or Lent. I’m already thinking about the next time I make these delicious Mexican Stuffed Sweet Potatoes. 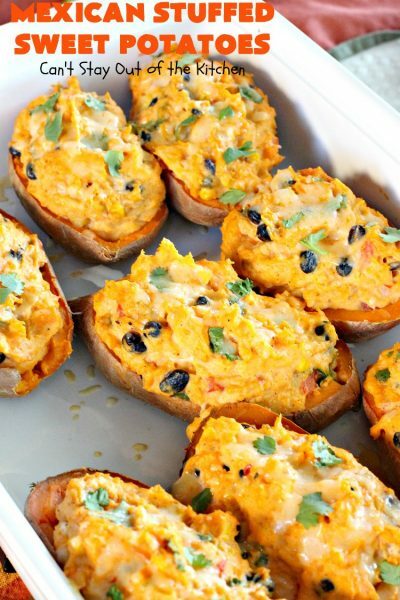 These favorite sweet potatoes are elegant enough for company. 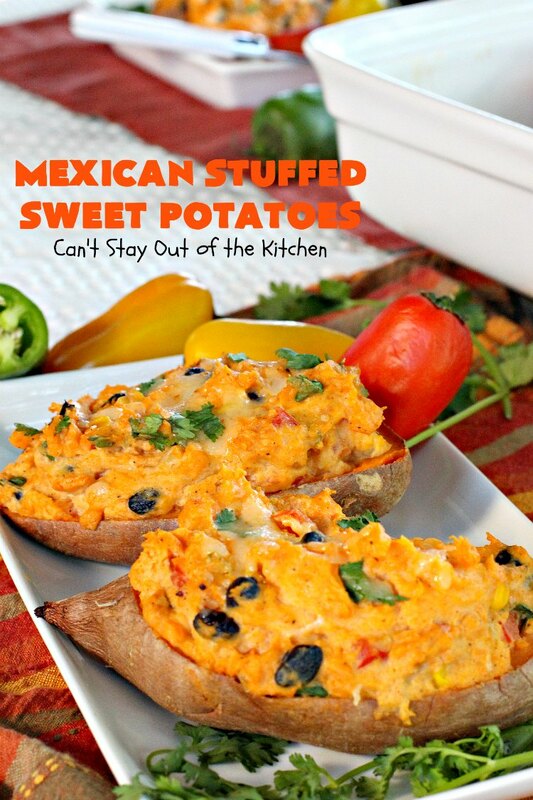 Mexican Stuffed Sweet Potatoes are perfect for company or holiday meals like Cinco De Mayo. I’ve set one aside for you. Bon Appetit! I can’t describe just how wonderful this recipe tasted. My daughter in law served us black bean and sweet potato enchiladas last night for dinner and those were amazing. I’ll be making those soon, too. I can’t get enough of sweet potatoes. I’d eat them every day of the week! I can’t even begin to explain how fabulous these sweet potatoes were. I’m ready to make another batch right now! You’re welcome. And they are amazing!